Created with Posting Made Easy! Find out How! You have found the best shingle and tile roof cleaners in the entire Tampa Florida area! That's a pretty bold statement, but call us at 813-655-8777, and we will prove it to you! In the 20 + years we have been offering our guaranteed safe, non pressure roof cleaning service, we have cleaned nearly 20,000 shingle and tile roofs! If you are looking for the very best non pressure roof cleaning in the Tampa Florida area, you have done your homework well! It is a common mistake to believe "all shingle and tile roof cleaning in Tampa is the same, as long as it is non pressure" and then start shopping, on price alone! Just because it is supposedly "non pressure roof cleaning" doesn't automatically mean it is safe for your roof ! Plenty of Deed Restricted Customers in Tampa have learned, and many the hard way (with ruined roofs), that Pressure Washing any Roof is Bad News. But we still see dangerously strong chemical solutions being used on shingle and barrel tile roofs in Tampa Deed Restricted Subdivisions every week, by companies that lack our training, experience, and equipment. These strong, extremely caustic chemical cleaning solutions, can cause just as much, and even more damage to your shingle and tile roof as pressure washing will. We see victims of this type of so called "no pressure roof cleaning" cry every time it rains, as they watch more and more granules fall off their Shingles ! These unwary Tampa Deed Restricted customers finally call their roofing contractor, only to find out that their roofing warranty is null and void, because of the improper non pressure roof cleaning chemicals that were used! Don't YOU be a victim of the bait and switch con men, or the incompetent idiots out there, ruining or greatly shortening the life of peoples shingle and tile roofs ! Call your Tampa or Brandon area Roofing Contractor, and ask them about our reputation for quality work, at affordable prices. Apple Roof Cleaning Tampa FL (813) 655-8777 is the areas largest Non Pressure Roof Cleaning Company. 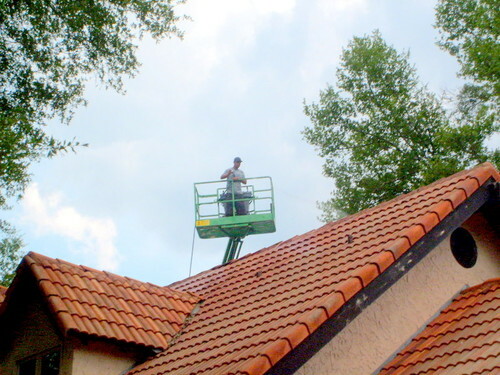 We have 2 full time dedicated shingle and tile roof cleaning trucks to serve you better. Apple Roof Cleaning Tampa FL won the Chamber Of Commerce Business Of The Year Award in 2002. No Roof Cleaning Company has cleaned more shingle and tile roofs in the Tampa Florida area w/o using Pressure Washing then us. All our shingle and tile roof cleaning trucks have 2 man Roof Cleaning Institute Trained & Certified Roof Cleaners to properly protect your plants and property. Call Apple No Pressure Roof Cleaning Tampa FL at (813) 655-8777 for an absolutely free, non pressure shingle or tile roof cleaning estimate and consultation. 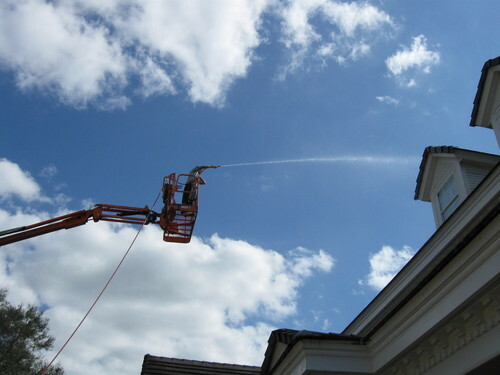 Aside from aesthetics, roof cleaning here in the Tampa Florida area is necessary to assure that you get the proper life from your tile or shingle roof, keep your A/C expenses lower, and for health reasons. 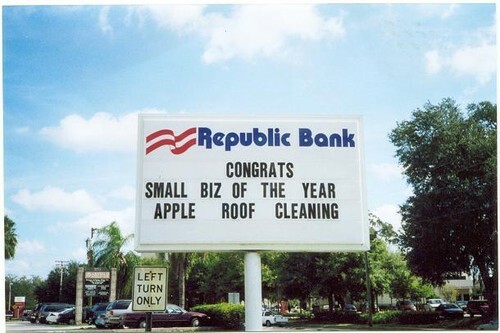 Not to mention the roof cleaning letters sent out by your Tampa Homeowners Associations. The culprit causing your shingle or tile roof to discolor and look so bad is a nasty type of black algae called Gleocapsa Magma, and it WILL shorten the life of your roof, plus it WILL make your roof darker and thus hotter from the sun's ultraviolet rays. This will make the inside of your home hotter, as well as speed the deterioration of your roofing materials. We use only Roofing Manufacturers approved and industry proven roof cleaning solutions, as well as specialized roof cleaning equipment designed to clean your tile or shingle roof, while keeping it safe from damage. We do not use any type of pressure washer on your roof. We do not use damaging roof cleaning products that require pressurized water to complete the cleaning, such as sodium hydroxide. We take every precaution necessary to protect your plants and the exterior of your home. 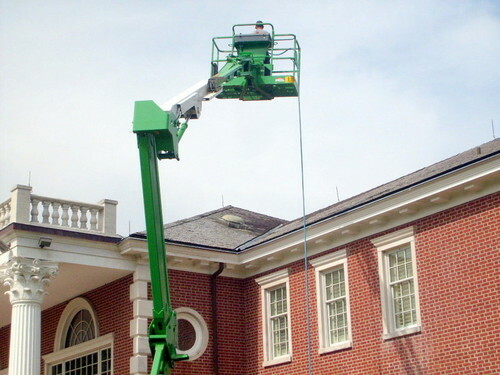 Unlike most of our "competitors", we employ the use of a dedicated ground person to keep the house and foliage well rinsed before, during, and after the roof is cleaned, and then treated with our exclusive roof treatment algaecide. This will assure that your plants will not die, your house will not be damaged, and no one will be injured during the cleaning process. Do you really want some inexperienced part time pressure washing contractor or jack of all trades falling off your roof while you're at work, and then blaming you for his lack of experience and safety? We have seen it many times, an inexperienced part time pressure washer on a customer's roof blasting away at full pressure, using little or no cleaning chemicals or algaecides, and causing damage to a shingle and tile roof that likely won't be noticed for years. Don't be a victim of inexperience. With Apple Roof Cleaning Tampa, you can "Experience the Difference, Because the Difference is Experience!" Ask about our annual keep your roof clean forever maintenance program! Our no pressure roof cleaning and treatment system will keep your roof algae free for quite some time, but nothing will stop the algae from eventually beginning to grow again in your roof's surface, long before it becomes visible to the naked eye. By that time, the roof algae is well rooted into the surface of your tiles or shingles, and has already started degrading the integrity of your roof. After your initial no pressure roof cleaning, we can apply, at a significant discount, an annual re-treatment to kill this roof algae that has already begun to grow back. This will assure that your tile or shingle roof will last as long as possible, and will prevent future roof cleaning letters from Tampa FL Area Homeowner Associations! Call Apple Non Pressure Roof Cleaning of Tampa FL today at 813-655-8777 for a free roof cleaning consultation and cost estimate! When you call us, we will ask you some questions about the roof type you have, shingle, tile, or metal, and the size of your home. You will then be provided with an immediate cost estimate, all by phone. What could be easier, and no high pressure salesman will visit you either. The price quoted will be the final price you pay, and it can be less, never more, if the roof cleans up easier then we thought. Beware of "bait and switch" low ball roof cleaning price games! Unfortunately, there are some companies in Tampa well known for offering a super low price to clean your roof, to "get their foot in your door". Then, they will try to make their money by insisting you buy other inflated price cleaning services they offer, that you had not planned to purchase! Look below at the before and after pictures on this page, to see the dramatic difference a properly done no pressure shingle and tile roof cleaning can make! Call ua at 813-655-8777 for Free Estimates! Promotions: Group Roof Cleaning Discounts! Other Details: Senior and Military Discounts! Group Roof Cleaning Discounts!